You probably know by now that the Bank On Yourself method relies on a specially-designed dividend-paying whole life insurance policy, issued by a company that is financially very strong and has an unblemished track record of paying dividends for 100 years or more. But you may be wondering about those mysterious riders (or options) that are added, which grow your cash value significantly faster than the whole life policies most financial experts talk about. So let’s take a peek under the hood and see exactly what those riders are and how they make your cash value grow so much faster. A key goal of the Bank On Yourself strategy is to maximize the growth of your cash value without increasing your premium. 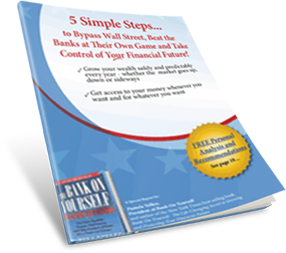 The cash value is the storehouse of money you’ll use to bypass banks, credit card and finance companies to become your own source of financing. Use that money wisely, and you might eventually be able to finance most or all of your lifestyle from it! Policy 1 is a traditional dividend-paying whole life insurance policy for a healthy 35-year-old we’ve called Martin for no particular reason. All of Martin’s premium is allocated to the base policy, and no riders are added. A policy that’s all base has a larger death benefit to start, but that comes at the expense of the growth of the cash value. See the circled amount on the line for Policy Year 7? This is significant because beginning in this year, the annual cash value increase is more than the premium Martin pays each year. (His $12,405 cash value increase is greater than his $12,000 premium.) This makes Martin a happy camper. In Policy 2, only 40% of each year’s premium goes into building the base policy. The remainder purchases Paid-Up Additions. Paid-Up Additions are the most efficient way to build cash value because they channel most of the premium directly into the cash value portion of the policy, while purchasing a small death benefit. A Paid Up Addition is like a mini-life insurance policy that requires a one-time-only premium. See the circled amount on the line for Policy Year 5? With much of the premium purchasing Paid-Up Additions, the annual cash value increase begins exceeding the annual premium two years earlier than in Policy 1. (The $12,572 cash value increase is greater than the $12,000 premium.) Woohoo! Well over 90% of every Paid-Up Additions Rider premium dollar goes directly to building cash value, very little goes to the cost of the death benefit, and only a minuscule amount goes to the advisor as a commission. An advisor who wants to help you build your cash value by adding a significant Paid-Up Additions Rider must be willing to take a huge cut in commissions. Learn how to find a Bank On Yourself Authorized Advisor who knows how to structure these policies properly and is willing to give up much of his or her commission. Note: The premium you pay into your Paid-Up Additions Rider is an optional premium. You don’t need to pay it to keep the policy in force. So in a pinch, you can cut back on it, and some companies will even let you catch up on some or all of it later, as your situation allows. That gives you greater flexibility than a traditional no-frills whole life policy has. In Policy 3, only 30% of Martin’s premium is used to pay for the base policy. The remainder purchases Paid-Up Additions and a term insurance rider. What’s a Modified Endowment Contract, or MEC? The IRS places a limit on the percentage of premium that can be channeled into the cash value of a life insurance policy – without jeopardizing its tax benefits. If the policy exceeds this limit, it becomes a MEC and loses a key tax advantage. The limit is based on a complicated formula that compares the cash value to the death benefit. 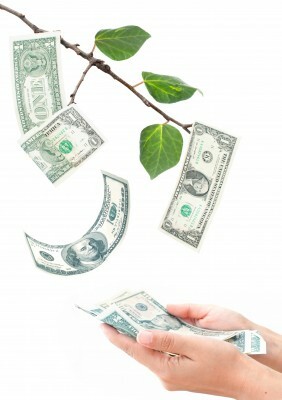 The higher the death benefit, the more money can be channeled into the cash value. Why add a term rider to a whole life policy? Hasn’t Bank On Yourself been saying term insurance is a bad idea? As a substitute for permanent life insurance, generally yes. But term coverage has a valuable place as a rider to a permanent policy. Here, the term rider allows you to pay more into your PUAR, and thus build cash value faster, without running afoul of the modified endowment contract (MEC) guidelines. Note: It’s important to understand that it’s not always possible to structure a policy so that only 30 percent goes toward the base policy. Every policy is different based on many variables such as age, need for insurance, how soon you plan to take retirement income, etc. But when you with with a Bank On Yourself Authorized Advisor, they will structure your policy to direct the lowest percentage of premium to your base policy that will let you achieve the goals you set for your plan – without turning the policy into a MEC. Getting back to Policy 3, you’ll notice several interesting items. First, look at the circled amounts on the line for Policy Year 1. At the end of the very first year, Policy 3 has almost eight times more cash value than in Policy 1 (the policy with no riders at all). A properly applied Paid-Up Additions Rider and term rider provide that powerful super-charging effect. Now check out the circled amount on the line for Year 4. The PUAR and the term riders have caused Martin’s annual cash value increase to exceed his annual premium beginning in the fourth year – one year earlier than Policy 2, and three years earlier than Policy 1. (His $12,337 cash value increase is greater than his $12,000 premium.) Go, Martin! Your reward for patience in the early years of your policy is a growth curve that gets steeper every year you keep the policy. Even the supercharged policies used for the Bank On Yourself concept grow more slowly in the early years. It takes a while for your cash value to equal the premiums you paid, though from day one, your premiums are immediately providing you with the full death benefit of your policy and the peace of mind this brings. Go back to the chart and look at the line for Year 20 in Policy 3. Beginning this year, Martin’s cash value increases by more than twice the amount of premium he pays ($26,077 cash value increase, compared to $12,000 premium paid). And beginning in year 30, his cash value increases by more than three times his premium ($37,994 cash value increase, compared to $12,000 premium paid.) Martin’s doing his happy dance now! Even more exciting: Look at the line for Year 40. That’s the last year Martin is scheduled to pay any premium at all, and the policy keeps on growing, but without any premium payments. See the line for Policy Year 50? The premium paid was zero, but the cash value grew by $59,425 – no luck, skill or guesswork required. One more thing to keep in mind – it’s possible to have even more cash value than shown in this chart, depending on how you use your policy for financing major purchases. That’s another reason it’s important to work with a Bank On Yourself Authorized Advisor who can show you ways to maximize the value of your plan. Each policy is custom tailored – there are no cookie-cutter plans – so your plan won’t look like Martin’s. However, you can find out what a plan designed for your unique situation, goals and dreams can look like when you request a FREE Analysis. When you do, you’ll get a referral to one of the Authorized Advisors. More Cash Value Plus More Death Benefit? Let’s compare the death benefits in Year 1. In the early years of Policy 1, the cash value was relatively small while the death benefit was relatively large, right? 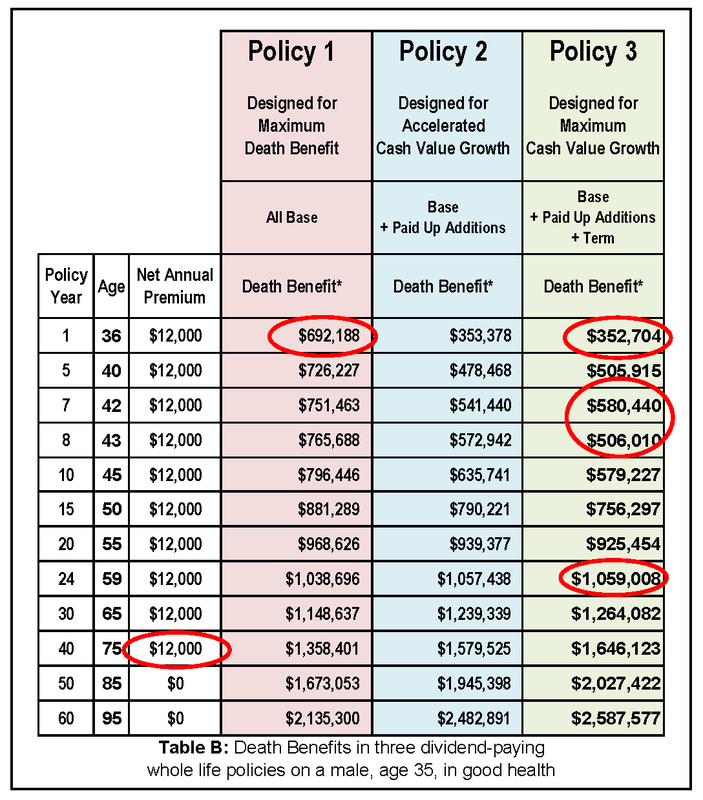 In the first year, the death benefit in Policy 3 is a little more than half of the death benefit in Policy 1. For Martin, this is a good thing, because the growth of his cash value is very important to him. He’s paying for roughly half the death benefit, but he’s building almost eight times more cash value, with all the financing power, control, and tax advantages that a Bank On Yourself-type life insurance policy offers him. Something significant happens in Policy 3 in Year 7. In this particular example, the death benefit drops from $580,440 to $506,010 the following year. Huh? This happens because the term rider is jettisoned. But now Martin’s policy is positioned for maximum cash value growth and the death benefit in Policy 3 is growing even faster than in either Policy 1 or Policy 2. 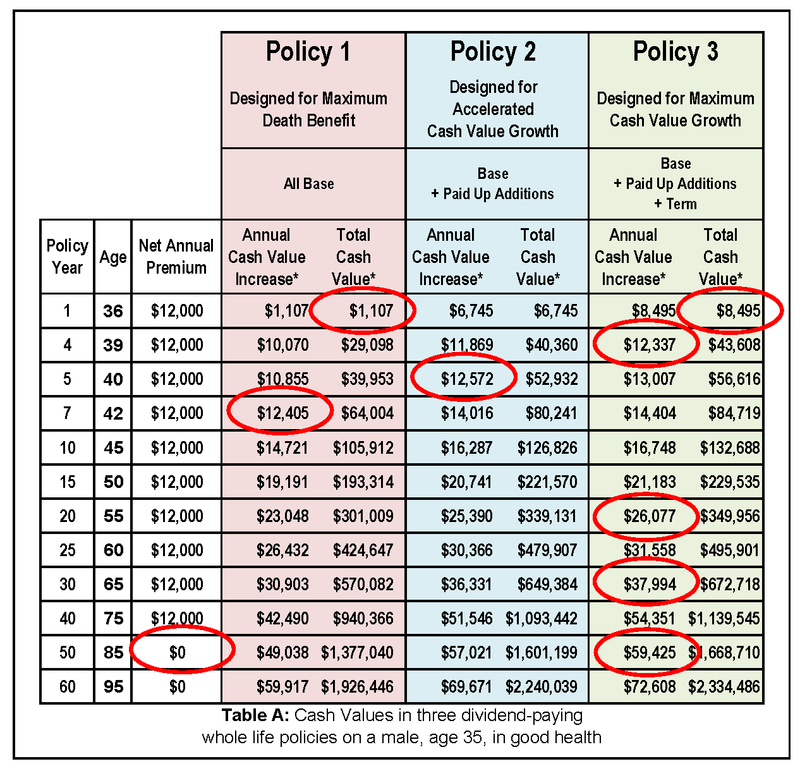 In fact, by Year 24, Martin’s death benefit in Policy 3 exceeds what he would have had in either Policy 1 or Policy 2. In Year 40 in each of these policies, Martin’s premiums will stop, because the policies were designed to be fully paid up at age 75. However, both his death benefit and his cash value will continue to grow each year. By Policy Year 50, the death benefit in Policy 3 tops $2,000,000, even though he didn’t pay any more premiums after Year 40. If Martin passes away at age 75, Policy 3 could allow him to leave a legacy of $1,646,123 for his family or favorite charities. And that gift can pass income tax-free under current tax law, and without going through probate. Should he live until 85, Martin’s legacy can grow to more than $2 million, and should he live to 95, it could grow to more than $2.5 million. Like Martin, you can enjoy a wealth-building and retirement income strategy that comes with guaranteed, predictable growth, safety, tax advantages, and more. It’s a step-by-step process that’s outlined here. To find out what your bottom line numbers and results could be if you added Bank On Yourself to your financial plan, request a FREE Analysis. * Annual Cash Value Increase, Total Cash Value and Death Benefits are based on the dividend scale as of March 2013. Dividends can change and are not guaranteed, however the companies generally recommended by Bank On Yourself Authorized Advisors have consistently paid dividends every year for more than 100 years. Policies from different companies may vary.